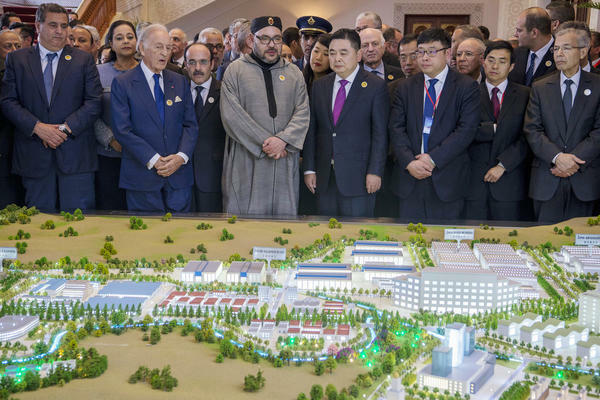 China plans to build the Mohammed VI Tangier Tech City in this part of Morocco, as a monument to China's expansion into a North African nation on Europe's doorstep — once it finally gets off the ground. Chinese President Xi Jinping and Moroccan King Mohammed VI walk outside the Great Hall of People in Beijing in May 2016. Chinese tourists browse at a shopping area in Casablanca in 2016. Chinese tourism to Morocco has skyrocketed in recent years, following a loosening of visa restrictions. 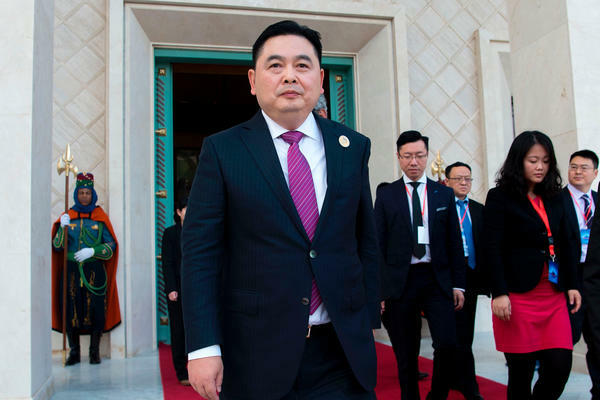 Haite Group chief Li Biao leaves a Moroccan palace near Tangier in March 2017. The extent of the company's involvement in the Tangier Tech City project is no longer clear. Ilyas El-Omari, the Tangier region president, says there was a disagreement between Morocco and the Chinese company Haite Group over who would own the city. At a grand signing ceremony presided over by Morocco's king in March of last year, Li Biao, the CEO of the Chinese Haite Group, outlined the ambition: a city of gleaming high towers and industrial zones that will attract as many as 100 Chinese companies and expected investment of $10 billion over the next decade. According to a promotional video, the area is expected to cover 7.7 square miles — about six times the size of Central Park in New York. The scale of the Mohammed VI Tangier Tech City project is in line with other sweeping infrastructure plans China is backing across several continents as part of an economic integration initiative Beijing calls a "new Silk Road." But in the months since the announcement, problems seem to be already setting in. The start date for construction appears to have been delayed. Insiders and experts say the project is riven with pitfalls that show that nothing about China's expansionism is easy. The idea for the city was first made public during a visit by Morocco's King Mohammed VI to China in May 2016. Serenaded by a full brass band, President Xi Jinping and the Moroccan royal agreed to partner on everything from the environment to the military to the economy. In Morocco, Chinese language centers are being set up in several cities, universities have opened joint political institutes, and each nation's state banks have opened branches in the other. 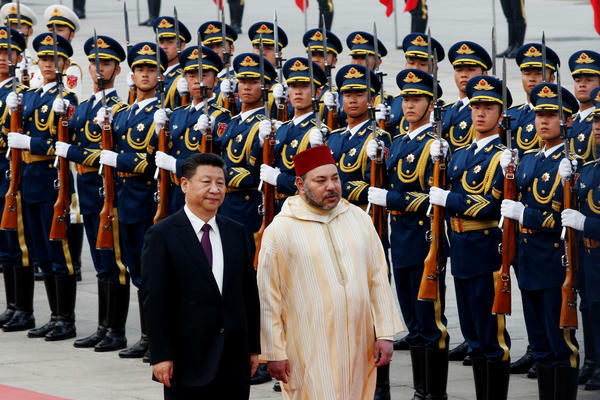 China was even the guest of honor at this year's Tan Tan Moussem, an annual gathering of Morocco's nomadic tribes. 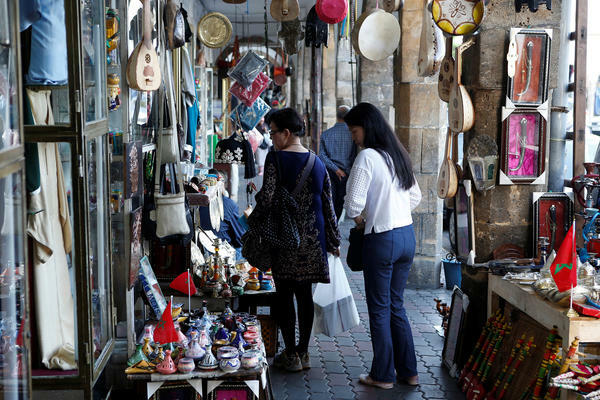 Chinese tourism to Morocco has skyrocketed, following a loosening of visa restrictions. "In 2013, we had 7,000 [Chinese] tourists. Last year, there were more than 120,000," says Hayat Jabrane, the former general secretary of a Moroccan tourism industry association. A growing number of those visitors, she says, are entrepreneurs looking for business opportunities in the country. "Today China means power in the world, you know," Jabrane says. "I think we will win with China, and China will win with Morocco." For the moment, she adds, most of the Chinese businessmen she works with have private enterprises. They've come to Morocco to open factories for textiles or other goods to export. Jabrane's optimism about Chinese investment comes as Morocco positions itself as industrial hub for other economic powers. Ravi Prasad, an analyst who has advised Chinese companies on investing abroad and tracks China's ambitions at the blog Belt and Road, says China wants to take advantage of Morocco's valuable free trade agreements with Europe and the United States. "This tends to be one of the primary motivations for going abroad," he says. "The fact that simply by relocating you can avoid a 15 to 20 percent tariff that might otherwise be imposed on your product." Morocco's location is the other big attraction. Sharing a coastline with the Strait of Gibraltar, which links the Atlantic Ocean and the Mediterranean Sea, it lies just across the water from Spain and is a potentially valuable gateway into both Africa and Europe. "All the officials, they pushed to present this like something very big for the country. Something very innovative for our economic and social development," he says. The promotional video for the city describes a place that "integrates industry with urbanism." It includes a "smart" residential area, where homes will be fitted with the latest technologies. Modern structures are set amid lush gardens. Greenways divide the city into 10 business areas. Haite's website describes the company as an "enterprise group mainly engaged in the aviation industry and industry in China." It does not appear to have extensive experience in city building, although it lists among its projects a "40,000-square-meter high-tech aviation zone" in Chengdu in southwestern China. The Haite Group did not respond to NPR's repeated requests for comment. But a source in the company, who spoke on the condition of anonymity because they did not have permission to speak to the media, acknowledged there are "problems" with the Tangier Tech City project and said the company has pulled out altogether. Another source close to the Chinese Embassy in Morocco said they also believe Haite is no longer involved. Deborah Brautigam, an expert on China's activity in Africa at Johns Hopkins University, says the Haite Group had not "come across our radar before." And she advised caution in believing the initial grand announcements of projects like these. "It's not a done deal until you actually see some cold, hard cash flowing across the border," she says. "We've found in Africa that the [Chinese] companies that are sort of new or inexperienced, they are often the ones that have come with a sort of flashy introduction because they need to get attention. But that doesn't mean they're able to follow through." Elalamy, Morocco's industry minister, refused to say whether Haite was still involved, saying in a written statement that the identity of the investors is private — even though the project was first announced as a joint venture with the Haite Group. "The company who will own the city and build it needs to be Moroccan. We welcome Chinese companies but only as investors," he says. China is making investments around the world, which matters because where China's money goes, power may follow. Our next story takes us to Morocco, where China has plans to build an entire city from scratch. It's near Morocco's coast. The Chinese hoped to export from there to Africa and Europe, but the project is riven with pitfalls, possible evidence of how China's global expansion is not going to be easy. NPR's Ruth Sherlock reports. 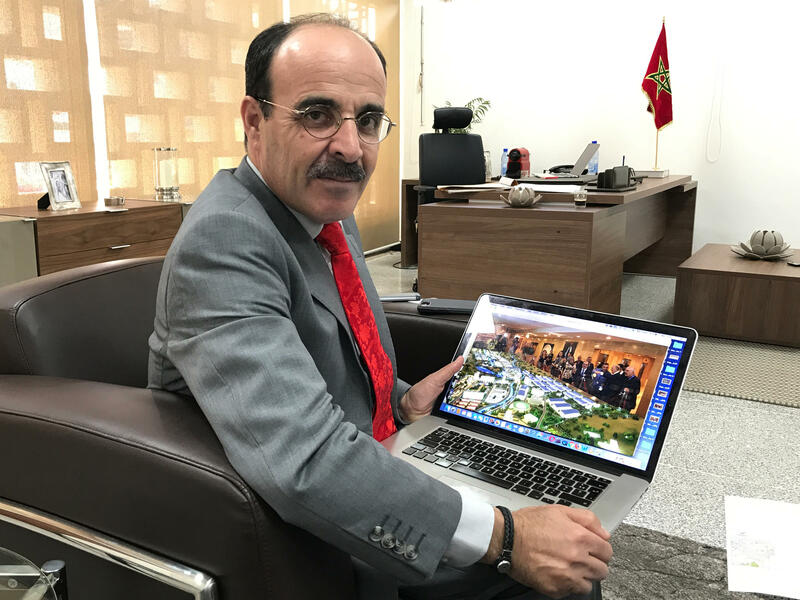 RUTH SHERLOCK, BYLINE: At a grand signing ceremony between Morocco's king and the country's new Chinese business partner, the audience in the city of Tangier watches a flashy promotional video for the new city. SHERLOCK: It shows wide, tree-lined boulevards, gleaming skyscrapers set amid lush gardens and an industry hub for everything from aeronautics to the latest technologies and renewable energy. In all, it will be home to some 300,000 people. In the ceremony, shown on local television, Li Biao, the CEO of the Chinese company the Haite Group, laid out the scale of the company's commitment. LI BIAO: (Through interpreter) We expect to create a hundred thousand jobs and attract a hundred Chinese companies that will create materials for planes, cars, textiles, and the manufacturing of machinery. SHERLOCK: Li says this marks a new relationship between China and Morocco. SHERLOCK: When the deal was signed last year, the Moroccan government said the first factory would be built by the spring of 2019. We arrive, though, to find no construction at all. There is nothing here, though. SHERLOCK: We call up somebody from the local municipality to check if we're even in the right place. SHERLOCK: We're at where the Google Map pin is, but is it - is it hilly? Is it a scrubland? He assures us we've arrived. You can see mile after mile of gently undulating scrubland. There's some villages. It's extremely rural. I'm watching a farmer walk his two cows through the field. There are some sheep in the near distance. SHERLOCK: Hi. There's a donkey going past, laden with heavy bottles of water and children running after them. Across the road in a cafe, we meet with 38-year-old Mustafa (ph). He gives only his first name because he worries that talking to us will anger local officials. MUSTAFA: (Through interpreter) This Tangier tech area we're looking over is owned by the region now, not the people anymore. Some people are OK with the situation and others aren't. SHERLOCK: Mustafa says he's waiting to see if the project will even happen. This is the key question, but it's a sensitive one. That's because the project goes beyond business to the highest of political heights. SHERLOCK: The grand plans for this city were made during a state visit by Morocco's king to China in 2016. Serenaded on national television by a full brass band, China and Morocco promised to become partners on everything, from the environment to the military and the economy. SHERLOCK: And today in Morocco, it feels as though China is everywhere. There are Mandarin language centers in the main cities. There are joint political institutes. Hayat Jabran, the former general secretary for the private Moroccan Confederation of Tourism, now runs a travel agency. She says the number of Chinese visitors has skyrocketed. HAYAT JABRAN: We started with this market in 2013 with 7,000 tourists, and we closed last year, which is 2017, for more than 120,000 tourists. And we are expecting, for 2020, around a half million. SHERLOCK: And what's even more exciting is that Chinese businessmen are showing up, looking for opportunities. JABRAN: We will win with China, and China will win with Morocco. SHERLOCK: Jabran's travel agency is in the coastal city of Casablanca. The city's downtown, defined by the grand, white-painted buildings from the time of the French colonials, now has a Chinatown. SHERLOCK: At a Chinese restaurant there, we meet with Li Yong, who heads Morocco's main Chinese Business Association and owns a factory for handbags and suitcases. Over plates of sesame chicken and sweet and sour prawns, I ask him - what's attracting Chinese businessmen to Morocco? SHERLOCK: Morocco is important for China, Li says, because it's a gateway to two continents, Africa and Europe. RAVI PRASAD: This tends to be one of the primary motivations for going abroad. SHERLOCK: This is Ravi Prasad, an analyst with Belt And Road, a blog that tracks China's ambitions around the world. He says the Chinese love to find business in countries like Morocco that have free trade agreements with Europe and the United States. But not all of China's mega-projects live up to their headlines and macro numbers. PRASAD: The reality is those numbers almost invariably don't meet the numbers that are reported. You go country to country - Ethiopia, Nigeria, Poland - and you ask them, how much have the Chinese pledged in their memorandums of understanding, and how much has actually been invested? And there's a huge, huge gap. SHERLOCK: This may help explain why the construction site we visited in Tangier is still scrubland. Deborah Brautigam, a professor at Johns Hopkins University and an expert on China's activity in Africa, says she sees this happening again and again. DEBORAH BRAUTIGAM: All of these things that China says this, or China says that - it's not a done deal until you actually see some cold, hard cash flowing across the border. SHERLOCK: In the case of Tangier, it looks like there might be no hard cash flowing. 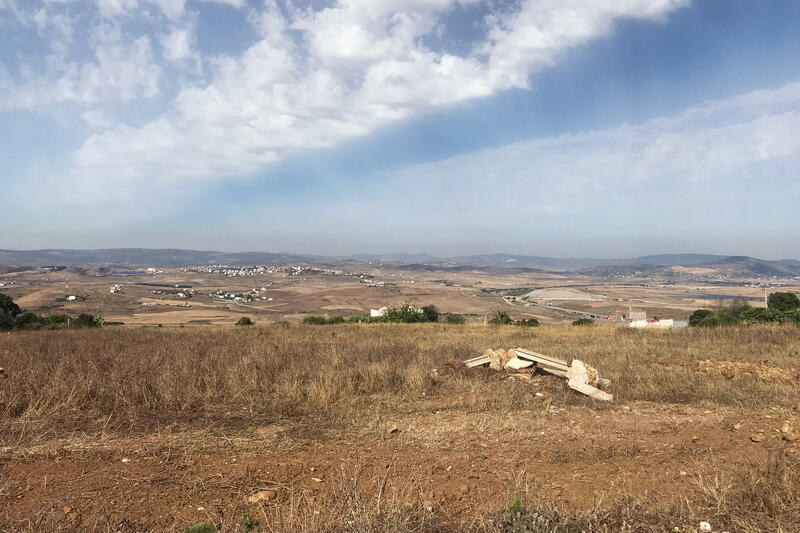 The Chinese company involved, the Haite Group, refused all our requests for interviews, but a source there told us that the company is no longer involved in the Tangier project. Others have questioned the ability of the Haite Group to take on a project like this. Brautigam, the China-in-Africa expert, says she hasn't run into the company in her research. Of all the actors in the Tangier project that we reached out to, only Illyas al-Amari, the Tangier region president, agreed to talk. We meet in his office, where he shows us a thick report of how the city would be laid out. SHERLOCK: He insists the project is not behind schedule. AL-AMARI: (Through interpreter) The research takes time. We're talking about building a city, not some small artificial area. SHERLOCK: When it comes to the Haite Group, he admits, though, that there are problems. He says they wanted ownership of the city. AL-AMARI: (Through interpreter) We said no. The company who will own the city and build it needs to be Moroccan. We welcome Chinese companies, but only as investors. SHERLOCK: Whether that's good enough for the Chinese remains to be seen, and so does the sparkling, high-tech city in the scrubland. Ruth Sherlock, NPR News, Tangier, Morocco. Transcript provided by NPR, Copyright NPR.